While attending the VinItaly trade show in NYC recently, I had the unique opportunity to attend a “Master Tasting” featuring Conte Brandolini (yes, an actual Count, as well as a winemaker) and 6 vintages of his Vistorta Merlot. It included the current release – 2009, the first release – 1990, and 4 in between: 2007, 2004, 1999 and 1997. Despite Brandolini’s comment that “it’s impossible to really get to know a wine without tasting at least 4 or 5 vintages,” most of us don’t often get the opportunity to compare vintages of any wine side by side, so my expectations were heightened. 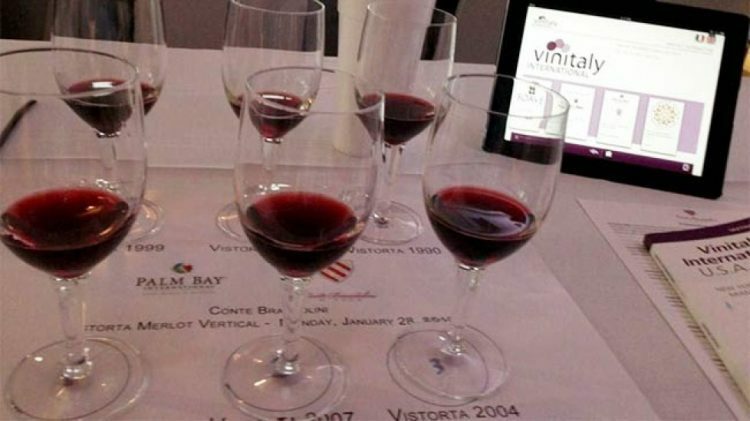 Though vertical tastings can go older to younger (increasing in tannin and intensity as the tasting progresses), most go younger to older, as complexity and nuance typically increases with bottle age. True to form, the 2009 Vistorta was tight and tannic, drinkable but seemingly not ready to show its best stuff. As the age increased, the Merlot showed more savory notes, including herbs (especially when a small percentage of Cab Franc was present), stinky cheese, sweat, and tobacco. All of the Vistorta Merlots are an exercise in elegance and restraint, making it difficult to believe that they’re made from the same grape as their California brethren. Brandolini’s estate is in Fruili, the most northeasterly province in Italy, just north of Venice and west of the Slovenian border, so cool weather abounds. The Count also believes strongly in the importance of balance in wine, keeping the alcohol low so that the wine remains versatile with food. This is not a surprising opinion coming from an Italian, of course, despite the fact that it might make the wine less marketable internationally. “Right now in PA, though, the 2006 Vistorta Merlot is on sale for $11.99,” I mentioned. “I’d definitely pay $12,” he responded with surprised enthusiasm. I would too. I did, in fact. Available in very limited quantities, I scored a bottle at a nearby state store. Though obviously not tasted alongside the others, the 2006 slotted into my memory alongside the other vintages as I would have expected. It was elegant, featured bright acidity, lovely dark fruits, and subtle notes of earth and tobacco. And forget the traditional Merlot food pairings; this plays more like a Loire Cab Franc or Burgundy Pinot Noir (try it with roast chicken). Having tasted through much of the portfolio, it seems highly likely that it’ll age well for 5-10 more years – how often does one say that about $12 wine? – though it is certainly nice to drink right now.